The Facebook for Windows Phone app has received a significant update today that brings an improved layout for the UI and a major boost in performance, particularly on slower Windows Phones. The update, v5.3 for those keeping score, looks more native to Windows Phone than the previous version and Facebook Messenger is now supported in the app. This is an interesting development given that Facebook is pushing iOS users to a standalone Messenger app (which is also available for Windows Phone). be a far more reliable and enjoyable experience. Other updates to this version include the ability to upload videos to your Facebook Timeline from within the app and a post detail page that shows you more information about a post. While this update to Facebook for Windows Phone has only been out a few hours, it is a significant improvement and one I would recommend to all users. You will appreciate and enjoy the new look & feel along with the more stable performance. 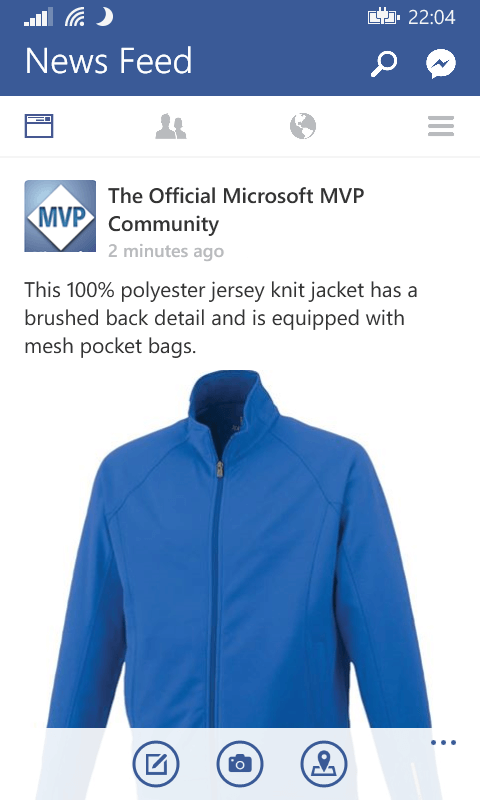 The Facebook for Windows Phone app is available now in the Store. You will need a Facebook account to use the app. If you have automatic updates enabled on your Windows Phone, you may have already received the update. Check the Action Center on your device.